Duplicate post. more details in link now. 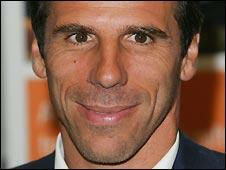 West Ham boss Gianfranco Zola insisted his lack of managerial experience would not hamper him in his new job when he was unveiled at Upton Park on Thursday. The Italian, who has signed a three-year deal with the club, has not managed a club side before. "I know I am not the most experienced manager, but I have ideas and have been involved in football for 20 years," the 42-year-old said. The man who replaces the first casualty. Never managed before but West ham dont mind that one bit. Cheap Charlies, those cockney fcks ! !